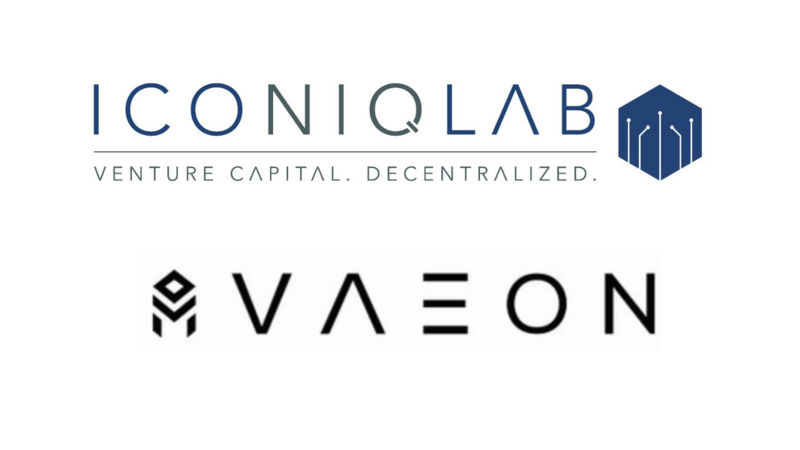 Press Release (ePRNews.com) - FRANKFURT, Germany - Nov 06, 2018 - Iconiq Lab, the world’s first decentralized venture capital group, announces a strategic partnership with VAEON Protocol, the first ICO worldwide backed by EOS VC. This partnership solidifies Iconiq Lab’s already strong portfolio of startups including the likes of Unibright, Topl, Vlux and Solidified. VAEON Protocol is backed by EOS VC, a business subunit of the developers of EOS blockchain technology, Block.One, through their joint venture with FinLab AG, a German investment firm and company builder specializing in the fintech sector. VAEON is a decentralized protocol that enables individuals to fully regain control of their personal data and benefit from its value while giving companies the opportunity to build new business models in an ecosystem free of any middlemen. VAEON is a self-governed layer 2 EOS protocol which clearly defines how personal data is structured, exchanged or sold. It’s a pleasure to collaborate with the first ICO ever backed by Block.One, the company behind EOS. As a brand new addition to the highly curated quality startups of Iconiq Lab, VAEON has already started working with the Iconiq team to fine-tune their ICO strategy. The VAEON team, led by Andreas Mikolajewski, is extremely competent in their vision to build the infrastructure necessary for the transparent use of data; where users themselves are in full control of the monetization and usage of their professional, social, health-related and other types of data. “It’s a pleasure to collaborate with the first ICO ever backed by Block.One, the company behind EOS. As a brand new addition to the highly curated quality startups of Iconiq Lab, VAEON has already started working with the Iconiq team to fine-tune their ICO strategy. “The VAEON team, led by Andreas Mikolajewski, is extremely competent in their vision to build the infrastructure necessary for the transparent use of data; where users themselves are in full control of the monetization and usage of their professional, social, health-related and other types of data. The Iconiq Lab team is eagerly looking forward to collaborating further,” remarks Iconiq Holding Managing Partner Max Lautenschlaeger. The VAEON Protocol team has already begun the Iconiq Consulting track and recently participated in the Asia Blockchain Tour and Malta Blockchain Summit alongside Iconiq Lab. Iconiq Holding is building the premier digital asset management ecosystem, creating trusted financial vehicles and business opportunities for investors in the blockchain market, driven by the ICNQ token. Iconiq Holding launched the world’s first decentralized venture capital club, Iconiq Lab, and is a Sponsor Firm of the Gibraltar Blockchain Exchange (GBX). Full details related to the ICNQ token can be found at https://iconiqlab.com/icnqdeck. Join the Iconiq community at https://t.me/iconiqlabchat. VAEON Protocol is an independent, open protocol that runs on EOS and clearly defines how personal data is structured, exchanged or sold. A self-governed layer 2 EOS protocol, VAEON Protocol allows every user to securely combine their profiles, personal data, professional credentials and networks of contacts into one standardized source they can protect, share or monetize as they wish. Learn more about VAEON Protocol at https://VAEON Protocol.io/ and join their Telegram channel at https://t.me/VAEON Protocol.